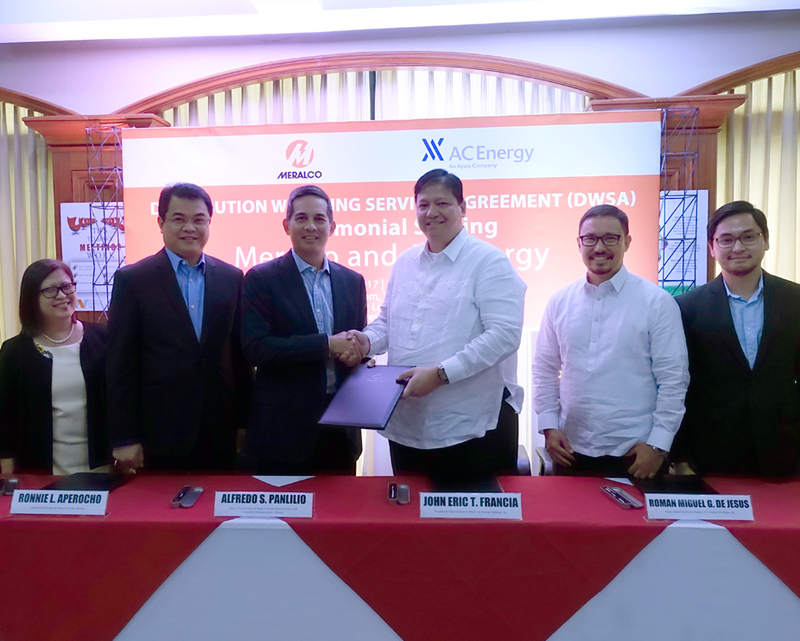 January 12, 2016 — AC Energy Retail, the Retail Electricity Supply (RES) unit of AC Energy, signed a Distribution Wheeling Service Agreement (DWSA) with Manila Electric Company (Meralco) to tap its services for the conveyance of electricity to the former’s contestable customers. At the signing event were AC Energy President and CEO Eric T. Francia, AC Energy Retail Head Roman Miguel G. de Jesus, Meralco SVP/Customer Retail Services and Corporate Communications Head Alfredo S. Panlilio, SVP/Networks Head Ronnie L. Aperocho, and AVP/Competitive Market Group Head Agnes R. Macob. In September 2016, AC Energy was granted a Retail Electricity Supply license allowing the company to sell electricity to the end-users in the contestable market. Pursuant to the government mandated retail competition and open access (RCOA), end-users with high volume consumptions (contestable customers) are allowed to choose their electricity suppliers to encourage competition in the power generation and supply sector.